Note to anyone who might have been brought here by a search for GNU: This is not the Free Software Foundation site. If it's the GNU Operating System you're looking for, follow this link. We at gnusystems have been doing bookkeeping, consulting and training in the Sudbury-Manitoulin area since 2000, when partners Pam Jackson and Gary Fuhrman moved from Sudbury to Manitoulin Island (north central Ontario, Canada). Pam is mostly retired now but still does occasional training and remote sessions. You can reach her at (705) 210-0529. XLGL is a third-party software tool we use to quickly and easily transfer data from Sage 50™ into Excel spreadsheets, which greatly simplifies financial reporting. Now you can buy XLGL online, directly from the source, by clicking on this link: Purchase XLGL. You can learn more about XLGL by clicking on the logo to the left. This is our new slogan at gnusystems. As of 2013, Pam is doing less bookkeeping work and more drawing, painting and other artistic endeavours. She's also moving into year-round gardening with our insulated greenhouse (a work of art in itself, built by Roland Aeschlimann). We're also involved with the cultural network toward community resilience and sustainable living on Manitoulin Island. See our Manitou Matters page for more about that. For the philosophical/scientific significance of accounting for what really counts, see the gnoxic research page. We also contribute what we can to the global movement toward genuine sustainability. The fundamental problem of our society and our species today is to discover a way to flourish that will not be at the expense of some other community or of the biosphere, to replace competition with creative interdependence. At present, we are steadily depleting the planet of resources and biological diversity; the developed world thrives on the poverty of the south. We are in need of an understanding of global relationships that will be not only sustainable but also enriching: it must come to us as a positive challenge, a vision worth fulfilling, not a demand for retrenchment and austerity. This is of course what we do day by day when we refuse to accept the idea that we must reject one part of life to enhance another. Projecting a new vision is artistic; it's a task each of us pursues in composing our lives. gnusystems is now a publisher! 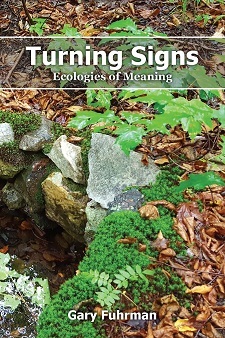 Gary's netbook Turning Signs is now available from us as a paperback (454 pages). To order it online, either paperback or PDF, go here. 4elements Living Arts: Community-building through artistic explorations of Manitoulin life. The Healing Century – a series of talks by Robert Theobald, broadcast on Australian public radio in 1998. Bohm Dialogue – based on a process (developed by physicist/philosopher David Bohm and associates) for liberating ourselves from the need to defend our own assumptions and attack those of others. Recognizing and ‘suspending’ our assumptions transforms them from barriers into signposts on the road to understanding. 4elements Living Arts: artistic explorations of Manitoulin life helping to build community. Maja's – a good place in Mindemoya to find (and learn about) local organic natural foods. Resilient Manitoulin blog. You can bookmark it, or subscribe to the RSS feed from it, to keep track of upcoming events on the Island (along with other matters of interest). Manitoulin Community Food Network has a website with a listing of local food producers. There's also a Community Food Security Directory downloadable from The FoodShed in Sudbury – it lists the Farmers' Markets and other food sources on Manitoulin as well as in the Sudbury area. Some organic food items aren't grown locally and often can't be found at local stores. To fill this gap, Pam started Manitoulin Organic Outsource, a buying club that enables members to order what they need and get it delivered monthly from the Ontario Natural Food Co-op to Maja's Bounty in Mindemoya. We also have an e-mail group for members, to coordinate ordering and pickup. There is no membership fee. Call Pam or email pam -at- gnusystems (dot) ca for more information. Not exactly Manitoulin, but close enough! Eat Local Sudbury Co-op store at 28 Durham St. just north of Elm. They also have a blog. To get the real lowdown on global food systems and the giant agribusiness corporations who dominate them, see The Ram's Horn (and other resources which can be downloaded from the site). Just Us coffee: Fair Trade products. John Caddy's Morning Earth site represents an inspiring marriage of ecology and poetry. The Worldwatch Institute provides a number of good resources, some of them free, including some blogs – for instance Transforming Cultures, which is an offshoot of their 2010 State of the World report. YES! Magazine – a great source for good news – information about alternatives (to the dominant self-destructive systems) that are actually working. Main focus is the U.S., but events elsewhere are covered too.